A Russian Proton rocket carrying three navigation satellites veered wildly out of control seconds after liftoff Monday evening (U.S. time), cartwheeled above the launch pad and began disintegrating in a flaming mass of debris as it fell back to Earth, exploding on impact a mile or so from its launching stand. 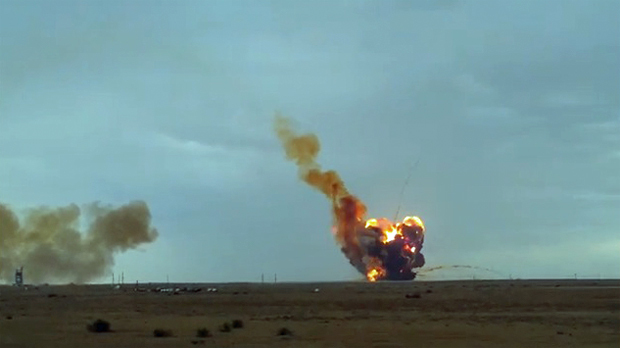 Russian news agencies said no one was injured in the conflagration as the rocket's 600-ton load of toxic propellants ignited in a spectacular fireball at the Baikonur Cosmodrome in Kazakhstan. 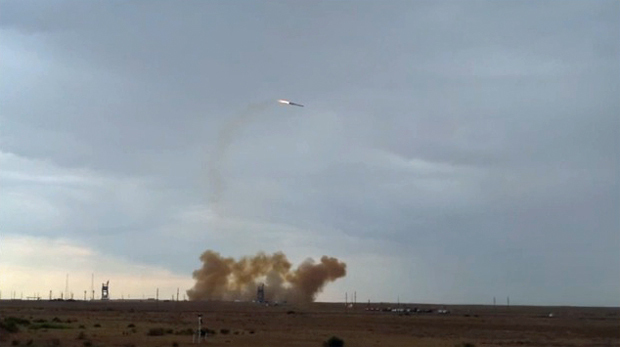 It was not immediately clear what went wrong, but the Proton-M rocket appeared to be in trouble within a few seconds of liftoff at 10:38 p.m. EDT Monday (GMT-4; 8:38 a.m. Tuesday local time). The rocket first veered to one side and then, beginning to rotate about its long axis, tilted the other way, looping into a nose-down plunge back to Earth. Shortly before it veered out of control, a dark plume could be seen in the rocket's exhaust trail, possibly indicating a propulsion or steering malfunction. The rocket began breaking up well before impact, with its forward section, housing three Glonass navigation satellites, tearing away as fire began consuming the booster. At impact, an enormous explosion could be seen, followed by a churning cloud of dark smoke. The rocket's toxic propellants -- heptyl, amyl and kerosene rocket fuel -- presumably were mostly consumed in the conflagration, but a towering, potentially dangerous cloud could be seen drifting away over the sprawling Baikonur launch complex. International Launch Services, a company that markets Proton rockets for commercial use, said in a statement "the impact occurred in a safe area that was evacuated for the launch and all personnel are reported to be unharmed. From early reports, there was no damage to either launch Pad 39 or 24, near the impact area; there is only minor damage to nearby buildings." The first three stages of the Proton rocket are built by the Khrunichev State Research and Production Space Center while the Block DM-03 fourth stage is provided by the S.P. Korolev Rocket and Space Corp., or Energia. In service since the mid 1960s, Proton rockets are the most powerful boosters in the Russian inventory, used to launch a wide variety of military and civilian spacecraft. Over the past five years, Russia has led the world in commercial rocket launches, controlling about 51 percent of the market, according to Space Policy Online. But the Russian program has experienced an unusual number of failures in recent years dating back to December 2010 when another Proton failure destroyed another three Glonass navigation satellites. Including that failure and this week's mishap, Space Policy Online reports that nine satellites have been lost outright with another six placed in useless or incorrect orbits. ITAR-TASS news agency reported that Russian Prime Minister Dmitry Medvedev ordered an immediate investigation of the latest failure and "demanded a list of the guilty persons, including high-ranking Roscosmos officials." The RIA Novosti news agency's version was slightly different, quoting a Medvedev spokesman as saying the prime minister asked for a list of officials responsible for the mishap.